2011 was our 12th year as an organization. With the decline in the economy, money has been tight and charities have been asked to do more with less. In 2010 PINS spent 7K more on our programs than we took in. In 2011 I’m happy to say PINS raised more money than it spent. This was mostly from year end grants we did not expect. In 2011, the PINS Spay Neuter Program was changed to increase the cat voucher from $25 to $30 to encourage more spay and neuter of cats. Another change, effective January 15, 2011, was PINS spay/neuter vouchers may be use at any clinic that will accept the voucher. Owners must check with the clinic prior to using the voucher. PINS provided to Meade County residents a $40 voucher for a dog towards spaying or neutering of their pet. In 2011 PINS provided funding for 604 animals at a cost of over $23K paid to veterinaries. This is the third year we have exceeded our goal of assisting over 600 animals. See the report below. PINS could not be as effective as they are without the cooperation of the county animal control officer, Jasper Hardesty, his assistant Allen Childress and the Meade County Judge Executive Gerry Lynn. Over the years, PINS has assisted the animal control officer various way. This year PINS has painted and spruced up the shelter, to include adding beautiful mural on the outside walls. 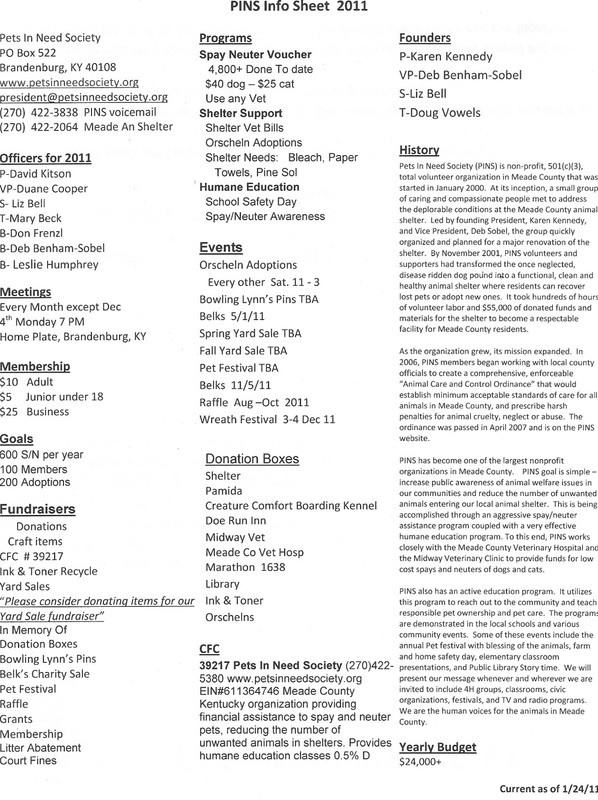 In 2011 Connie’s efforts resulted in the adoption of over 200 animals from the Meade County Animal Shelter. As mentioned in the beginning of this article, PINS paid over $23,000 to have Meade County dogs and cats spayed or neutered. As PINS is a registered nonprofit organization, all expenses must be raised by the members. To meet the costs of maintaining the PINS programs, many hours are spent by the members preparing for and working at local fund raisers. We have an annual bowling tournament at Lynn’s Pins. The spring and fall yard sales help with our fundraising and we collect items all year for this. Thanks to our members and supporters donating items, PINS earns about $800 at each yard sale. A simple way to help PINS all year long is to drop your loose change into one of our collection boxes (a miniature dog house) at 10 various local businesses. Small things add up! As you can see, PINS must work very hard to meet the budget each year. Dairy Queen Fundraiser was done once in 2011 raising over $150 and several new members joined us. This year Connie Mullins and Claudia Cooper were on the local radio station, WMMG 93.5FM Edgewise Program, to promote shelter adoption, spay neuter, current fundraising events and allowed listeners to call in with questions. Officers for 2011 were President David Kitson, Vice-president Duane Cooper, Secretary Liz Bell and Treasurer Mary Beck. Board of Directors were Deb Sobel, Leslie Humphrey and Don Frenzl. Membership was tracked by Katie Beck and Humane Education was done by Pat Bowen. One other volunteer, but most important position is that of the person who returns the calls on our PINS phone line, Doris Reesor. She returns more than 100 inquires each month and issues the spay and neuter vouchers. Fortunately, we have an eager group of elected volunteers ready to lead the Pets In Need Society in 2012. Newly elected officers are President David Kitson and Vice-president Duane Cooper, Secretary Liz Bell will keep the minutes, and Mary Beck will post the treasurer books. In addition, board members will be Deb Sobel, Leslie Humphrey and Connie Mullins. PINS currently has over 100 animal loving, motivated and energetic volunteers. Meetings are held the 4th Monday of every month at Home Plate Restaurant, Brandenburg, KY 40108. Meetings start promptly at 7 pm. Many members come around 6:30 and have supper prior to the meeting. We encourage all members of PINS to attend the meetings, and invite the community to come out and see what we are all about. Dues are only $10 a year, $5 for junior members, and $25 for a business member. Memberships expire in March and if you join now, your membership will be good until March of 2012. Join us and help make a difference in Meade County. For more information, email us President@petsinneedsociety.org , visit our website www.petsinneedsociety.org or call the PINS information line at 270-422-3838.